San Miguel One Pint Chalice Glass. LIMITED RELEASE. San Miguel One Pint Chalice Glass. Authentic San Miguel One Pint Chalice Glass with. 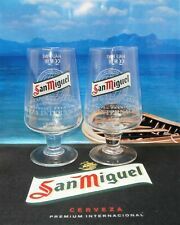 Pair Of San Miguel Pint Glasses *NEW*. Condition is New. Dispatched with Royal Mail 2nd Class. Please check out my other branded glasses I have for sale. Size - Half Pint 10oz. Quantity - 1 Glass. A bit about BrewerianaUK. SAN MIGUEL litre glass Ltd edition x6. Dispatched with Royal Mail 2nd Class. Size - Pint 20oz. Quantity - 2 Glasses. SAN MIGUEL PINT GLASSES (x2) - NEW / NUCLEATED / CE STAMPED. Dispatched with Royal Mail 2nd Class. 1 x New Limited Edition 125th Anniversary San Miguel Chalice Pint Glass. Condition is New. Dispatched with Royal Mail 2nd Class. Box 24 Unused San Miguel Chalice Pint 20oz Glass / Glasses. Condition is New. Dispatched with Royal Mail 2nd Class. Size - 50cl. Quantity - 1 Glass. A bit about BrewerianaUK. Official San Miguel Chalice Pint Beer Glass 20oz - Box of 4 - £3.71 per Glass!!! 5 out of 5 stars - Official San Miguel Chalice Pint Beer Glass 20oz - Box of 4 - £3.71 per Glass!!! 6 product ratings6 product ratings - Official San Miguel Chalice Pint Beer Glass 20oz - Box of 4 - £3.71 per Glass!!! CERVEZA SAN MIGUEL. Chalice shaped Pint Glass. and dia top of glass 7 cms. spoiling the experience for all of us - sorry. but also taking the following into account. Northern Ireland, Highlands & Islands. 2 x New San Miguel Chalice Pint Glasses CE 20oz / 568ml. Genuine Product. CE stamped (M15). Pair of (2) San Miguel beer glasses. Half pint, 14cm tall and about 5.5cm across the top each. Collection available in person from Rushden, Northamptonshire, about 6 minutes way from A45 and/or A6, NN10 area. CE stamped (M11). Half pint to brim, about 14cm tall and 5.5cm across the top each. Pair of (2) San Miguel beer glasses. nd Class to 1. Around 195g of weight (each). CE stamped (M12). Pair of (2) San Miguel beer glasses. One pint, over 17cm tall and about 7cm across the top each. nd Class to 1. Around 330g of weight (each). 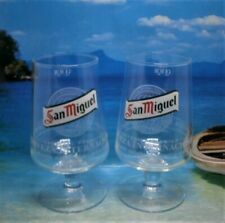 2 X San Miguel One Pint Tulip Glasses Tall & Slim Glass Pub Bar. Condition is Used. Dispatched with Royal Mail 2nd Class. 4x san miguel pint glasses Ce Stamped. Stylish San Miguel Limited Edition 2017 Pint Chalice Glass. Great for use or to add to your collection. Would also make a Great Gift! SAN MIGUEL 1 PINT STEMMED BEER Lager GLASS And Two Peroni Half Pint Glasses. Condition is Used. Dispatched with Royal Mail 2nd Class. 2 X San Miguel Spanish Lager Half Pint Drinking Glass Spanish Passion For Life. Condition is Used. Dispatched with Royal Mail 2nd Class. Size - Pint 20oz and Half Pint 10oz. Quantity - 2 Glasses. San Miguel Half Pint Chalice Glasses x 2. Great for use or to add to your collection. Would also make a Great Gift! ESPECIAL PREMIUM CERVEZA INTERNATIONAL. 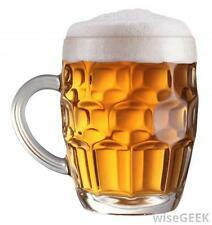 Chalice shaped 1 Pint Glass. SAN MIGUEL. 7cms dia rim of glass. spoiling the experience for all of us - sorry. 18cms high. CE stamped (M16). Half pint to brim, about 14cm tall and 5.5cm across the top each. Pair of (2) San Miguel beer glasses. nd Class to 1. Around 195g of weight (each).